We've done this before. Ask away! How do we book Elegant Ensembles? Deciding on your music and having it organized should be the easiest part of your wedding...seriously. This is how it works. Use the Inquire button to receive a quote. You determine which ensemble you would like based on your budget and the size of the wedding. We'll send you a login to our website with the quote. Login and enter the details and choices. You can update your music and details over time. We will email you a performance contract based on what you selected. Mail or email the contract back with the deposit and you are all set. From here, listen to music online, update music lists online in your account and ask for help when needed. We will send a final confirmation with all your details and music listed about a week before the wedding. A few days before, all the musicians performing will receive a checkin email to confirm the details exactly as they are listed in your account. Finally, enjoy the music on your wedding day! What sets Elegant Ensembles apart? We specialize in providing music of diverse styles and ensemble sizes. Instrumentation for ensembles include, the violin, viola, cello, string bass, flute, trumpet, oboe, piano, guitar and harp. You can hire a solo musician, duo, trio, quartet, quintet, or small chamber orchestra. We are detail oriented and will capture the critical information necessary to create a great performance through a specialized system that we created for the purpose of managing the details of wedding music. Do we sign an contract to engage your services? Yes, Elegant Ensembles does have a performance contract that helps both parties understand and lay out what is needed and expected for the event. If you would like to book a date, we will mail you a contract and after it is returned with the deposit, we will reserve your date and time. What happens if a musician is sick? Elegant Ensembles works with a core group of musicians in the area. If a musician is unable to attend, all efforts will be made to replace them with another Elegant Ensembles professional in the area. These situations are very rare and in virtually all the times this has happened, we have had enough lead time to replace the musician with another very qualifed performer. What is your experience with wedding music? The founder of Elegant Ensembles, Mark Snow, has over 20 years of experience planning and managing special events. He has a degree in Music Industry and has over 25 years of performance experience on his primary instrument, the viola. He has performed and arranged for large and small services over this course of time. Some notable services have included providing music for the wedding of a state senator, dinner parties for the chancellor of a major university, and performances at dinners and receptions at the High Point furniture market. Will we meet the musicians before the event? We offer unlimited phone and email consultations for no additional charge to assist you in planning the music for your event. If you wish, you may also schedule a time to meet with Mark to discuss the needs of the event. If necessary, the leader of the ensemble can be contracted to advise at the rehearsal. Please inquire if you think you will need someone for the rehearsal. Will the musicians play outdoors? The musicians will play outdoors provided that the weather conditions are acceptable. Unsatisfactory conditions include temperatures under 60 degrees, rain, excessive wind, and any other conditions that put their instruments or themselves in danger of being harmed. The instruments must also be protected from direct sunlight by a tent or another mutually agreed upon source of shade. You should have an alternative indoor location available in the event of weather complications. Generally speaking, we rarely have a problem with performing due to weather as there is either a place for shade or the ceremony has been moved indoors due to inclement or chilly temperatures. If you're not sure about how this might play out for your outdoor wedding, ask us. We have more than likely performed at your venue before and know what the best options are for your event. Can you play a special song? For the most part, music selections are limited to that which is contained in our current extensive repertoire. A detailed list is available on our website. Music selections outside of our repertoire and other special arrangements may require an additional arranging/preparation fee of $50-75 per song. In some cases, there is no fee at all if the music is already arranged for the ensemble you would like. We can let you know before you book. Just let us know what you are interested in. If we feel a certain piece will not work for the selected ensemble, we will let you know. Are any of the musicians students? 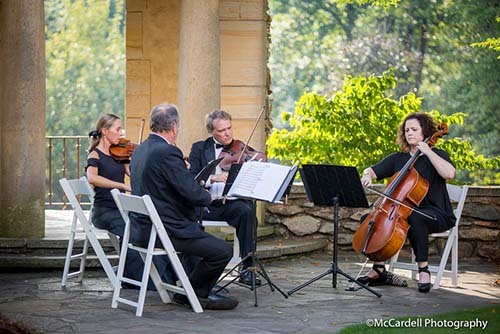 All of the Elegant Ensembles musicians are professional, degreed, classically trained musicians who perform locally in orchestras and other ensembles and have years of experience performing at weddings. When will the musicians arrive? The musicians will usually arrive 30 minutes prior to start time. The setup time for a classical group is minimal. What is the setup time for an ensemble? The setup time is minimal. It may take less than 5 minutes. The only possible delays are if there is a question about where we should set up or if the chairs are not readily available. Things run very smoothly if you discuss the location of the group ahead of time. The musicians should be in an area with adequate space and light, out of the way of guests/wedding party/wait staff. They should be in a position to see as much of the processional route as possible in the case of a ceremony. Do you require a source of electricity? Generally, no. As long as there is adequate lighting provided, no source of electricity is needed. How will the musicians know when to play? If you have a wedding coordinator, he/she will take care of letting us know when everyone is ready. In addition, you can detail out exactly what to watch for next to each music selection in the SamePage tool. This helps to keep everyone informed as to how many moms to seat, last words by officiant, etc. Sometimes the officiant will let us know when everyone is ready. It is a good idea to assign the job to someone not in the wedding party so they can let us know when everyone is ready to begin the seating/procession. How will the musicians know how to time the music? Good cues and notes! We will inquire as to the number of mothers, bridesmaids, etc. and will change pieces when it is appropriate. Occasionally, a wedding coordinator will cue us for each change. We have played a LOT of weddings and are used to how things flow. Please make sure to inform us of any special circumstances for your event. How long before the ceremony should the prelude music begin? You should hire the musicians to begin playing between 15-30 minutes prior to start time depending on your preference and when you think guests will arrive at the location. Where should the musicians perform from for the ceremony? The musicians should be in an area with adequate space and light, out of the way of guests/wedding party/wait staff. They should be in a position to see the as much of the processional route as possible in the case of a ceremony. Please consult your church/venue for specific restrictions. For example, some churches do not want musicians at the altar. It is best to discuss any concerns with us. We often assess the situation upon arrival and find the best location. Can you accompany a vocalist? It is possible. It is important that we make sure we have music that works for the selected ensemble and that is the same arrangement and in the same key as the one the singer is accustomed to. You may need to send us a copy of the music for us to assess whether or not it will work as is. If the piece will need some arranging, this may require an extra fee. If the style is inappropriate for the ensemble, we will let you know. Also,-it is recommended that you set up a rehearsal for the singer and musicians on the day of the event prior to the contracted start time. If we are going to accompany someone we are unfamiliar with, it is important for the musicians to hear how the singer is interpreting the song and for the singer to get used to performing with the ensemble. Yes, Elegant Ensembles does have a performance contract that helps both parties understand and lay out what is needed and expected. If you would like to book a date, we can mail you a contract and after it is returned with the deposit, we will reserve your date and time. We accept cash or checks and we can setup an online payment for you using a verified payment processor to process Visa or MC payments. There is a small fee of 3% for online payments. Checks should be made payable to Elegant Ensembles. Should we tip the musicians? It is not required, but the musicians certainly appreciate a tip for good service and music. How do I decide which ensemble to choose? Your choice of course depends on your personal taste. However, we recommend the trio comprised of violin or flute, viola, and cello or a quartet. Both combinations are very flexible and provide a brilliant and rich sound at an affordable price. The trio ensemble size is featured on our website in a number or recordings and videos. Pop music usually needs a trio or quartet to allow the music to be reproduced well. A duo is best used at small weddings that have traditional classical music. No, the musicians do not make announcements. Often the DJ will have a P.A. system with microphone and they may be able to make announcements for you. Is it necessary for you to come to the rehearsal? No. We will work out all details when we arrive and prior to the event. It is good to remind your director or officiant to speak with us before the prelude begins so we can double check cues and the entrances.